highly selective allylation on the nojirimycin analog 481 to provide 482, which was then converted to the indolizine analog 438 (Scheme 84) . Schmidt converted the TCP-protected glucosamine derivative to 484 via a cationic allylation reaction. Compound 485 was then converted to the amino acid analog 486. The ^-selective allylation is noteworthy and is presumably due to the steric bulk of the phthalide-based amino protecting group, (Scheme 84) . Ley et al. found that exposure 487 to stannic chloride furnished a good yield of the disaccharide derivative 488 as a 1:1 mixture of isomers (Scheme 84) . 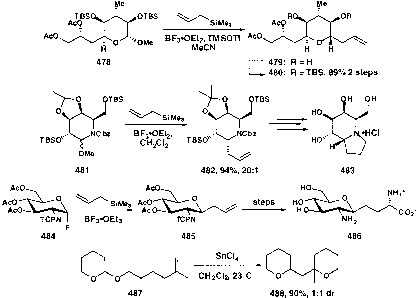 Two groups have prepared C-glycoside analogs of the natural product (+)-hydantocidin via Lewis acid mediated C-glycosidation of the acetal derivative 489 . Sano and coworkers succeeded in converting 490 to the succinimide analog 493 (Scheme 85) . A synthesis of the spirohydrouracil nucleoside analog of (+)-hydantocidin has also appeared .